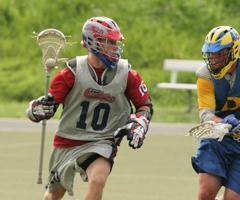 The first Alumni game took place on Saturday, June 7, 2008. It was played in the memory and honor of TC ‘06 Alum Wiatt Farrar who tragically passed away in February of ’08 at the age of 20. I just wanted to take a moment to thank you for honoring Wiatt this Saturday with the first Team Carolina Alumni Game. I am sorry that I will not be able to make the trip down to Greensboro from Washington, but will certainly be with you in spirit. I also want to thank you for your work in making Team Carolina a reality for so many kids that wouldn’t be/ have been on such a team without your efforts. While Wiatt’s passing has been most difficult for our immediate family, we’ve been blown away by the well wishes and comfort from family and friends. I feel that the emptiness and void our family feels will never go away; however, I am constantly being lifted out of the gutter by the wave of support from those who held Wiatt in the same high regard as I always have. As you both know, Wiatt was not one to wear his emotions on his shirt sleeve, hated the limelight, and would definitely be a bit embarrassed to be honored this weekend. Despite his unwillingness to share his feelings, I know that his summer with Team Carolina was by far the highlight of his lacrosse career. Wiatt relished playing at such a high level and was more than happy to distribute the ball from X to the likes of Tony Mendes, Chase Hayes, Bob Kercher & co. despite being pretty banged up that summer. He wouldn’t even talk to my Dad or me about his injuries because he knew that the opportunity to play with those guys was a brief one. I wear his Team Carolina gear with pride, knowing how much the experience meant to him. Due to the increasing level of play in North Carolina and the selective nature of Team Carolina, each team member, past and present, has been given a “gift.” While Wiatt was not the biggest or fastest player on the football, basketball and lacrosse teams he played on, he always maximized his potential. Growing up, we were fortunate enough to encounter a counselor at summer camp who gave a speech about effort and quoted Steve Prefontaine who put it best by saying “To give anything less than your best is to sacrifice the gift.” This message stuck with that little red-headed kid and there is nothing that makes me more proud of my brother than knowing that he always left it ALL on the field. If there is any message you relay to those guys on Saturday, I ask that you encourage them to enjoy the unique opportunity of playing together and to always leave it on the field.